Insteon®, creators of the world’s premier home automation and control technology, today announced an exclusive distribution partnership with Smartnex. Smartnex will be Insteon’s only distributor in Brazil, bringing the connected home to the masses. 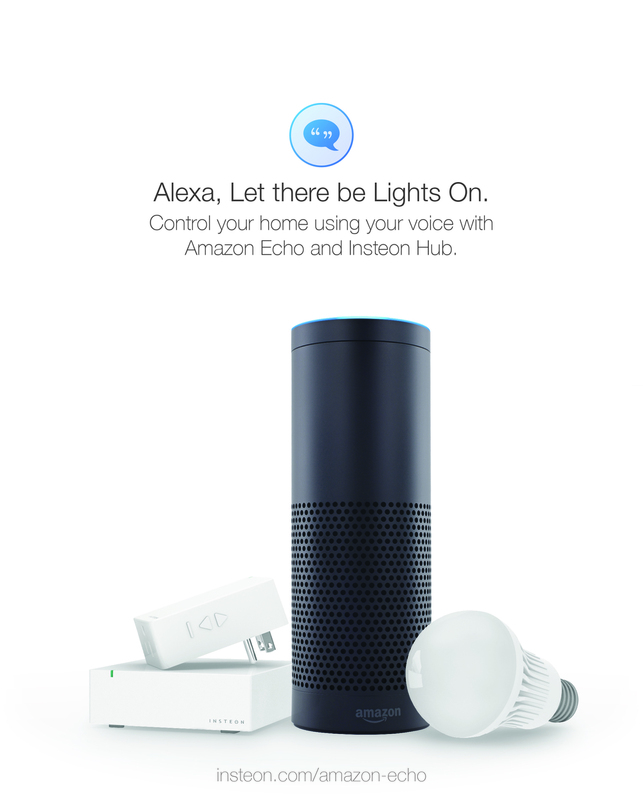 Irvine, California – September 25, 2015 – Insteon®, creators of the world’s premier home automation and control technology, today announced that you can control Insteon devices with Amazon Echo. With Amazon Echo, Insteon Hub (2245-222) customers can use their voice to control their Insteon connected home. Alexa, the brain behind Amazon Echo, will be able to understand and facilitate requests from across the room. Users can say, “Alexa, set the living room lamp to 50 percent” or “Alexa, turn off AllLights” to direct their Insteon devices. Users can also create a group that includes Insteon devices, as well as other manufacturers such as Philips Hue and Belkin WeMo controlling all of them with Amazon Echo. To get started, customers will need to use the Amazon Alexa app to give Echo access to the Insteon Hub. Then, they can control select Insteon wall switches, plug-in modules and more. Since Amazon Echo is designed around your voice, hands-free and always ready – it’s easy to ask Alexa to turn on the lights when your hands are full, or ask her to turn off the lights at a moment’s notice. You can also use Amazon Echo to adjust dimmable lights to a certain level, if desired. For more information, please visit www.insteon.com/amazon-echo. Los Angeles, California – August 20, 2015 – AVAD LLC, North America’s leading provider of solutions to the residential and commercial custom installation markets, has added Insteon®, the most reliable and best-selling wireless home control networking technology, to its lineup of products. Insteon allows users to control lights, alarms, thermostats, sensors, garage doors, fans and other connected devices from anywhere using a smartphone, tablet or Apple® Watch. The Insteon Hub is the ‘brains’ that connects mobile devices to the home allowing the user to set thermostats, monitor cameras or check sensors. The Insteon Hub allows creation of schedules for easy automation, scene-building to control multiple devices simultaneously and gives instant alerts via email or push notifications if something is amiss. The system also works with the Nest Learning Thermostat® to provide side-by-side control options. The Insteon system has zero monthly fees to view, control, and monitor a home with modules that are easily expandable through a large range of Insteon products. There is no limit to the size of an Insteon network and installations with more than 400 devices are common. Insteon uses a unique and patented dual-mesh technology allowing the Insteon signals to travel further without interruption than any other technology. The dual-band technology ensures that powerline and wireless obstructions rarely impede signals, resulting in 100X more reliability than single-band networks. For more information on AVAD and Insteon, please visit http://www.avad.com in the U.S. or http://www.avadcanada.ca in Canada. Connect with AVAD on Facebook, Twitter and YouTube for news on the latest promotions and news. AVAD is an industry-leading provider of solutions to the residential and commercial custom installation markets. As an Ingram Micro company, AVAD provides integrators access to the industry’s top products and integrated solutions for video, audio, lighting control, content management, whole-home and business automation, as well as digital signage and design services. AVAD offers the broadest consumer electronics, home and business automation portfolio in North America. Further differentiating its services, AVAD invests in the business tools, technical support and services integrators need to grow their businesses, including the fully transactional AVAD Mobile smartphone application providing integrators on-the-go access to AVAD products and value-added tools. With 23 locations throughout North America, AVAD offers local, hands-on access to the latest products and trainings, as well as free support services including system design and technical support.